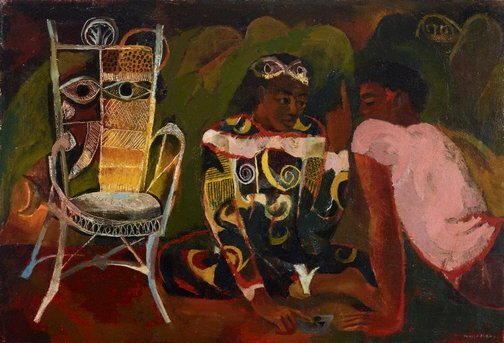 Donald Friend’s 'The fortune teller' was painted in Brisbane after he and I had been on a painting trip to North Queensland. Donald was looking through Life magazines and saw some photographs of an Indian ceremony which included elephants decorated with elaborate designs. Donald was fascinated and later incorporated the patterns into this painting. Signed l.r. corner, white oil "DONALD FRIEND". Not dated. Helen Campbell, Australian art: in the Art Gallery of New South Wales , 'Out of Sydney: city and hinterlands', pg. 185-186, Sydney, 2000, 206 (colour illus. ), 300. Christine France, Parallel visions: works from the Australian collection , 'Donald Friend / Margaret Olley', pg. 128-139, Sydney, 2002, 130 (colour illus. ), 132, 143, 147. Editor Unknown (Editor), The Sydney Morning Herald , Sydney, 30 May 1956. Editor Unknown (Editor), Daily telegraph and daily news , Sydney, 30 May 1956.